It’s nesting time now in our protected wetlands, and a really fun time — the biggest and smallest waders are settled into their annual nests (some of them, including the Great Blue Herons, return to the same nests each year). I’m running a bit behind on the nest-building activities, always a fascinating process to watch. But in the meantime, I couldn’t resist this episode that caught me unawares the other evening. I heard a GBH’s croaking cacophony (select the last option in this list — croaking calls, wing noise — for the best example) in one of the usually quiet rookeries. He or she was obviously not very happy. At the time, I couldn’t see the source of torment for the heron, who was probably chasing something away from a newly-created nest. The previous night, a group of GBHs was screaming in another rookery, because an alligator swam too close for comfort to their nests. I didn’t see the gator actually nab anything, but the collective croaking, screaming noise could be heard throughout the wetlands. As it turns out, an anhinga had the gumption to impede on this heron’s space. 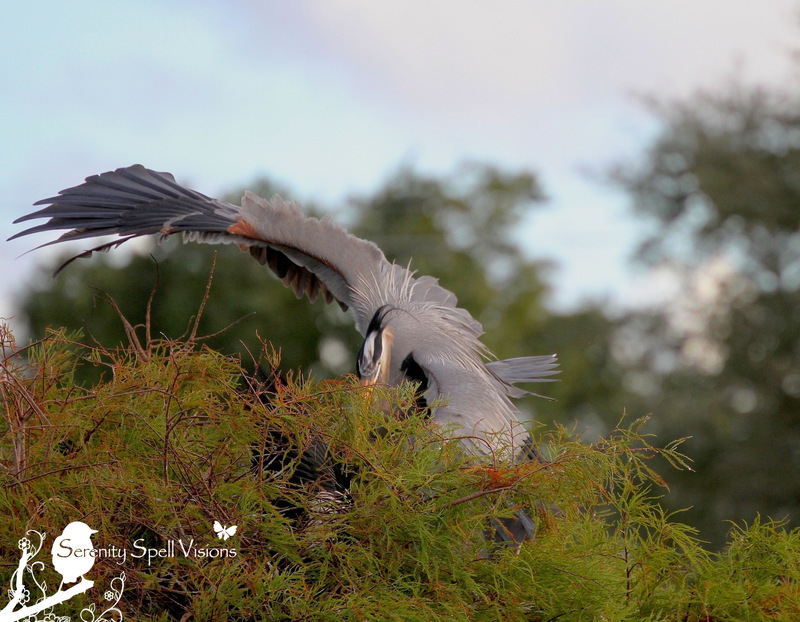 The look on the poor anhinga’s face as it’s being flushed out of the rookery is priceless…. Of course I was worried for the poor anhinga: Did he have a nest too, or was he just looking for a comfy spot for the night? Either way, I wish I wasn’t walking onto the scene so suddenly, and had some time to properly prepare for the shot, to include his appalled mug. And for the Great Blue Heron? Unabashed triumph. Wow. Great capture lady. Where was this taken? Thanks so much! One never knows what one will stumble across…. I think you captured it pretty well — even without prep time! I’ve never seen an anhinga, so I didn’t realize how small they were in comparison to the GBH. And you know, the anhingas aren’t small birds, by any means — but compared to the GBHs everything is diminished! Just stunning. And great reflexes. I think you did a great job capturing the scene too. Ah, thanks so much! I go there primarily to relax, and shooting is definitely a happy and close second… Or perhaps one and the same. 🙂 There’s always so much going on now, it’s great fun. Great pics and story! Love these birds. Thanks so much! They’re so magnificent… And no messing with ’em! Thanks so much!! Such beautiful creatures… As many times as I see them, I’m in awe of that wingspan. Just magnificent. Wonderful photos. Your shots are always very intimate. Unparalleled beauty. I wish that I could cuddle this bird. Awesome! All the better for cuddling!! What lovely birds. Thank you for posting them, and making me aware of their beauty. You are very good at it. Heh… It’s a phenomenal span! A great series! Don’t feel too bad for the Anhinga. Since you can see its breeding colors, it was likely trying to appropriate the nest for itself. Not a good idea! Exactly — they’re breeding as well. But in hindsight, it was actually the GBH that may have been infringing on the anhinga’s domain — this tends to be an anhinga rookery. I keep looking for a GBH nest there, and don’t see one; I think he was just being a big bully! Those are gorgeous photos! The details on the feathers and “personality” of the bird are so compelling. Really nice work. Stunning photos. That poor anhinga, just trying to find a place to sleep 😉 Never seen one before. that was some lucky encounter, nature at its fullest, greatest… Usually we want to see their habits, routine but never do. You have quite a beautiful set of photos! Thanks so much! It’s amazing what one stumbles across, at a moment’s notice… If the eyes are open. 🙂 Half the time I’m enjoying the sights, relaxing — and forgetting about the camera. So I’m always thrilled to actually *capture* something! What a coincidence that I just posted a GBH today too. Great views s on top of that tree with that exotic plumage. Ah, you did! Great minds think alike, hahaha! I can’t wait to check it out… 🙂 I love when they’re in their full breeding plumage — as if they couldn’t get any lovelier. Wow is right. Stunning photographs. And both are great subjects. Heh, thanks so much! It was funny to witness…. And the cacophony of croaking, oh my! Such a scene. Loving the action shots – cool:) Have a Great One! Happy early Friday to you! I didn’t know about anhingas. This one looks prehistoric. Great pics. Great photos and story. I really like the unabashed triumph look. What a great and impressive bird. And lucky you with all those interesting, beautiful birds around. They really are complete magnificence… Seeing them in person is something, too — getting a sense of their sheer SIZE. This area, and its incredible biodiversity, continues to amaze me. It’s something that we must, MUST protect and preserve. King of the Mountain standing high in all of his glory. Wonderful series of photos! It’s incredible to see creatures like that interact! 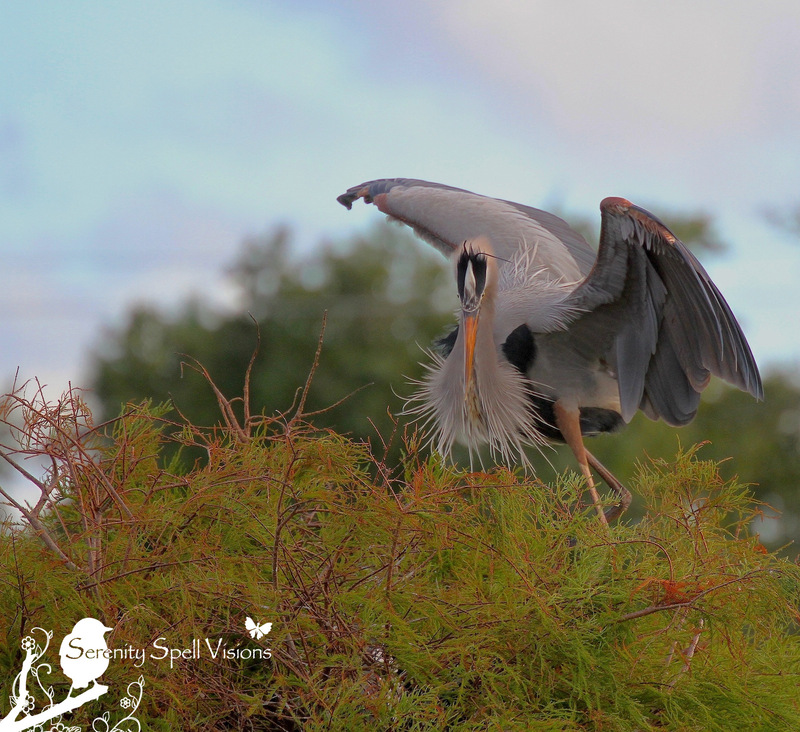 Fantastic shots of the nesting GBH! That anhinga looks like he got chased but good! FANTASTIC PICTURES – FANTASTIC STORY!! I TRIED TO GET A CLEAR VIEW OF THE OFFENDING ANHINGA BUT COULD NOT DISTINGUISH IT THROUGH ALL THE “FUR-FUR” SO THE SPEAK!!! Thanks so very much — I wish I could say that in Basque. Danke. Merci. I’ve spotted a few areas where black and yellow crowned night herons roost around here, but I haven’t a clue where the Great Blue are. I see them flying and fishing all the time – I suppose they just come in to work, and then fly home at night – wherever home is! The confrontations that always are going on among species are so wonderful – pecking orders don’t belong just to chickens! You’re right about the expression on that anhinga’s face. Priceless. Heh, I still chuckle at it… Poor guy though. I realize now that it’s primarily an anhinga roosting spot, and the GBH was being a bit of a bully! I still haven’t seen an actual nest. Down here, the species tend to nest together, it’s interesting — the anhingas and the GBHs, the egrets (various), etc. So perhaps they just wanted to find their own secret spot, away from those lesser herons, hahah! You’re exactly right… Omigosh, poor guy. I SWEAR, fishing line. the irresponsibility of humans. I always wonder, if they had witnessed this scene (the tangled wildlife), would they repeat the tossing of fishing line / nets into their habitat? Spectacular shots! They really give you a good idea of the size of the birds…and I can just imagine the noise! 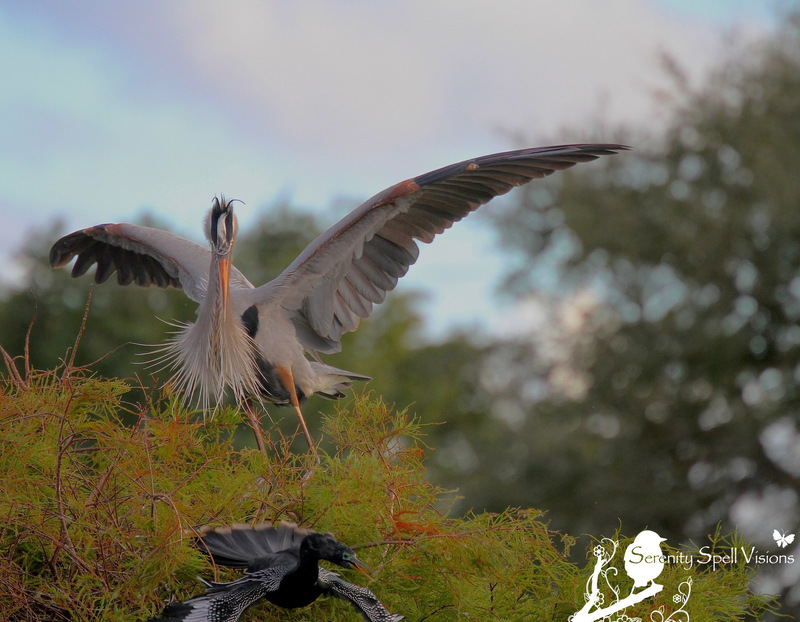 You’re absolutely right… Anhingas aren’t small birds, by any means. But Great Blues? Huge! And with their wingspans and bills, they can strike quite an imposing figure. And the noise, ah the noise… It’s hysterical. Just coming from this guy, who was bullying a poor anhinga!! Reblogged this on green adventure. 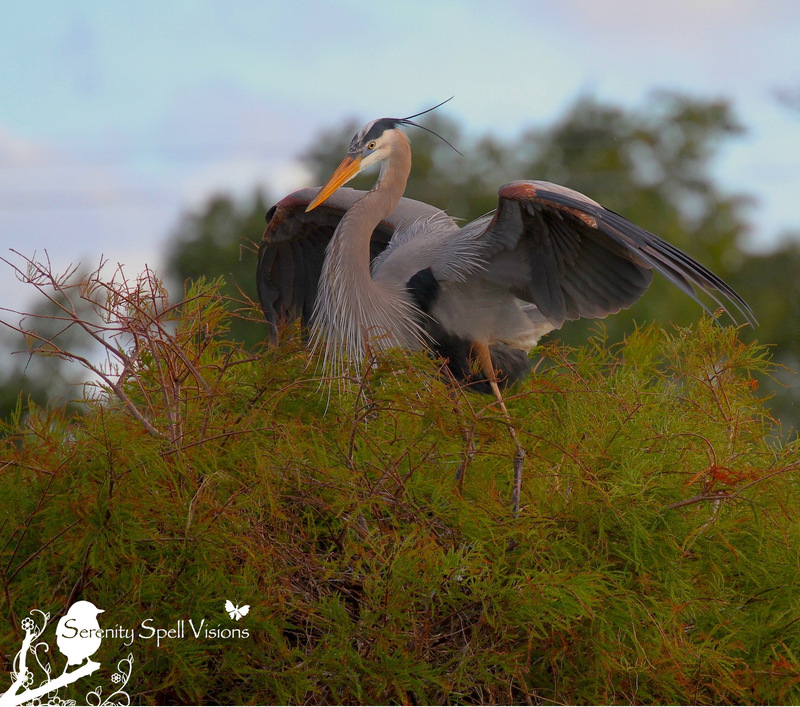 Those GBHs think they’re kings and queens of the marsh… Lovely photos of one of my fav birds.